I have been really busy trying to get a DVD together of my father's film, Gifts of an Eagle. I have been editing photos, doing layout and have been pretty deep into that for some time. Just wanted to pop in here for a minute and show you a slide I came across while looking through piles of old slides. 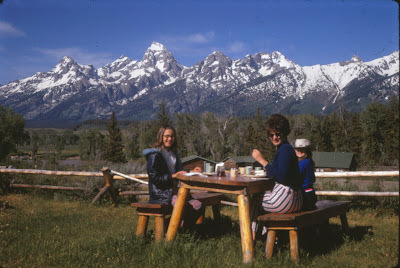 This is my mom, my sister and me eating at this outdoor restaurant in the Grand Tetons in Wyoming. This restaurant is family legend. We were out driving, this must have been around 1971, and kept seeing all these signs EAT AT MOOSE, GOOD FOOD, or something like that. They were laughably simple ads. But once we got there we decided to give it a shot. The food was amazing, cooked "chuckwagon" style, you dished out beans and mashed potatoes from big kettles and ate outside with an amazing view or you could eat in teepees. I looked for it recently on the internet and it is still around. My sister and mom have been able to visit there since. It has been operating for 62 years! If you are in Wyoming I recommend it.